I really want spring to come, and soon. So says my Ravelry queue. Here in Minnesota mother nature has it in for us. She really does. She likes to tease us with a few days of 50s and 60s, followed by a week of heavy wet snow, high winds, and temps in the 20s and 30s. Rinse and repeat. The only place in my world where spring has officially come to stay is on my Ravelry queue. The Summer issue of KnitScene is going to land in my mail box any day now and it’s this pattern that has me on tenterhooks. 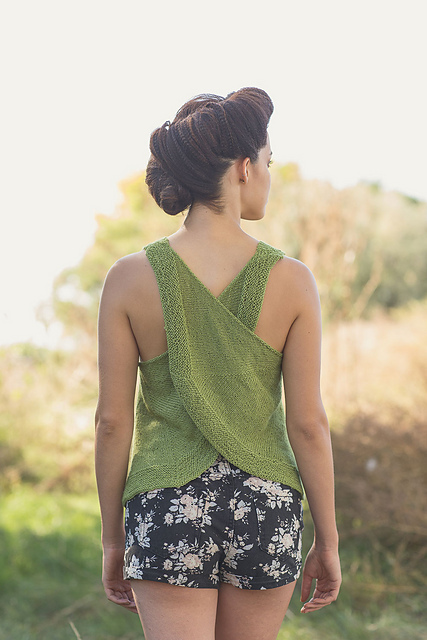 This drapey, crisscross backed tank tickles all my warm weather knitting pleasure centers. Wearable simplicity in the front, serious drama in the back. The pattern calls for Berroco Folio™, an alpaca/rayon blend. I’ll have to keep that in mind when choosing a yarn. Nothing with too much structure. I need fiber that just wants to hang and slither. Photo by Knitscene/Harper Point Photography. Used with permission. As seen on Ravelry. Can you tell I have a thing for dramatic details? Number two in my list is a luxurious silk top knitted in lace weight yarn. And just look at that sophisticated use of color work. I mean really, look at it. That’s what I call a killer detail. It just makes the pattern sing. Here’s one more thing to love. It’s a free pattern! The original was in Russian, but thankfully for me, there is an English translation. Here’s hoping the translation is well done, because I really, really, really want to knit this top. Used with permission. As seen on Ravelry. I honestly don’t know which one of these I like more, the cardigan or the pullover. Both feature a cunning octagon design and approachable raglan sleeves. I know, I know. Technically such worksheets shouldn’t be necessary and knitters should be able and willing to do their own calculations. But I appreciate a designer who’s willing to help her users along. This sort of pattern could be a good confidence-builder for a knitter who isn’t sure if they’re ready to do the math. An airy, lightweight tank. Perfect for someone with a small bust (like me) and toned arms to show off (which are on my to-do list). If only knitting built arm muscle. Maybe if i did it while standing and wearing wrist weights. This pattern calls for lace weight merino. Excellent! I have some lovely stuff in my stash just begging to become this tank. Previous Who Wants to do a Crafting Magazine Swap? I like the first and the last. In SF, our summers are usually cold. Now that we’re moving, I have to wrap my hear around much warmer weather. It’s so easy to forget that. Out here in MN it just gets hot and humid and stays that way, for the most part. One forgets that not all of CA is like LA. Hmm. Yes I think that could be an issue. I was wondering how this piece would work with a cotton/alpaca blend. Lighten things up a little. I love the first one! hurry up spring!! Welp, my queue just expanded. Thanks. Definitely some gorgeous options on this list! I know, Me too. So dramatic. Those are some lovely tops there! I don’t have any more tops planned at the moment, but I’d still like it to be Summer already so I can wear the ones I do have! Yeah no kidding. As soon as the weather gets warm enough, it’s going to be time to wash all the winter woolens too! All beautiful! Make them all!! The Russian stripe t is amazing!! Reflectance seems like a good place to start and go on from there. All are good choices. Thanks for a solid wish list.